Zeta Beta Tau is the first Jewish fraternity. It was established in 1898 as a group of students, who studied in deferent universities in New York City. The fraternity quickly grew and actively developed throughout its history. Now, Zeta Beta Tau is an extremely social fraternity that counts more than 40,000 initiated brothers and more than 90 chapters. Today, the fraternity continues to increase its popularity. The brotherhood programs of Zeta Beta Tau are concentrated on equal rights, privileges, and responsibilities. Do you want to look perfect and get unforgettable impressions on college graduation day? 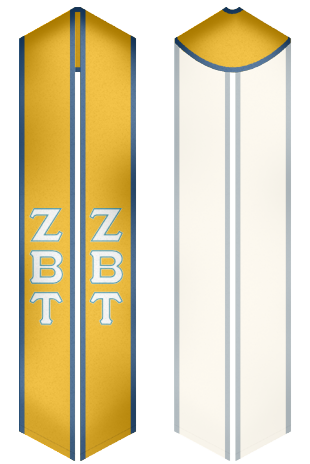 Purchase the best graduations stoles for Zeta Beta Tau fraternity at the lowest prices on our website!